Heidi was pregnant with daughter Leni when she and Seal started dating. Seal is the only father Leni has ever known. Heidi Klum and Seal have gone on to get married and have two more children, 1-year-old Henry and newborn Johan. 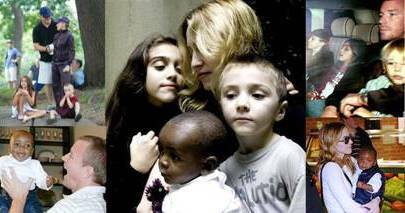 Madonna was mother to daughter Lourdes when she and Guy Ritchie got together. Carlos Leon, Madonna’s ex-trainer is Lourdes’s father. Madonna and Guy Ritchie are married now and had son Rocco together. Son David joined the family within the past few months. Angelina adopted oldest son, Maddox, at the end of her marriage to Billy Bob Thorton. She then adopted daughter Zahara as a single mother a few years later. She and Brad Pitt started a relationship after he and Jennifer Aniston divorced. Brad Pitt has since adopted Maddox and Zahara. Angelina Jolie and Brad Pitt had a biologicial child together, daughter Shiloh, at the beginning of this year. In the sub-catagory of Cutest Hollywood Baby, the winner is Kingston James McGregor Rossdale, son to Gwen Stefani and Gavin Rossdale. His parents aren’t so bad, themselves. 48 queries in 1.320 seconds.